Today I'm so excited to introduce you to my new friend Emerson, the feline star of Amanda Flower's brand new Magical Bookshop mystery series. Emerson is a very handsome tuxedo kitty who lives in a really cool shop. I think you will enjoy meeting him as much as I did! Mudpie: Welcome Emerson, thank you so much for chatting with me today. Could you start by telling us a little about yourself and how you came to live with Daisy and Violet? Emerson: Well, I am a very dapper tuxedo cat. I don't mean to toot my horn, but you should really have the true facts, you know. I was born in the woods behind Charming Books, Daisy's bookstore. One day, I got lost and wandered up to her back door. She took me in. She has a soft spot for all animals, you see. She convinced Benedict, her boyfriend, to adopt me. Benedict was a carriage driver. He and I had the best time taking tourists around Cascade Springs. I really loved that man. He died recently. He was murdered! Daisy's granddaughter adopted me after that. I think I will be very happy with Violet, but I do miss Benedict. Does your name have special meaning? I didn't have a name until I met Daisy, but when I came to her bookshop, Ralph Waldo Emerson's book appeared next to me. She said that meant that I was to be called Emerson. I do like the name very much. It goes with my dapper style. Because of the name, Daisy believed that there would be a connection to Violet. Turns out she was right! Now that I live with Violet, the day begins with walking her up with a couple of paw smacks to the head. She is NOT a morning person. Then, we work in the bookstore together. Violet is still trying to figure out what it means to be the Caretaker of Charming Books. I help where I can. And then there are the murders that keep seeming to happen... we stick our noses into those too. Is it true that Charming Books has a talking crow and a tree that grows inside??? Yes. Sigh. The crow would be Faulkner. He and I are on shaky ground. I believe he means well, but really isn't a cat a better bookstore mascot? And yes there is a birch tree that grows in the middle of the shop. It has been there for ages, back before the War of 1812 when Violet's ancestress Rosalee Waverly built the house that it now Charming Books around it. The bookshop would not be charmed without that tree. The tree is essential to the magic. Do you have any magical powers of your own? 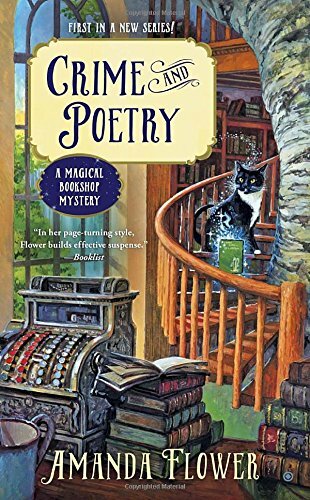 Tell us about Crime and Poetry, the first Magical Bookshop mystery that you star in? In Crime and Poetry, Daisy tricks her only grandchild Violet into returning to Cascade Springs, a village just outside of Niagara Falls, New York, by pretending she is dying. Grandma Daisy has to go to this extreme because twelve years before Violet left the village and swore that she would never return. Violet is not to happy when she returns to the village and finds her grandmother in perfect health and says she will leave the next morning. Unfortunately, she finds Benedict dead in his carriage that next day and the police declare Grandma Daisy the number one suspect. Violet must stay in the village to clear her grandmother's name. I heard a rumor that your character is based on one of your author's real cats. Can you confirm that? It is true! I am based on Amanda Flower's beloved Mr. Tumnus, a dapper tuxedo cat in his own right. Of course, he is known better to his fans as Editor Tummy. He and his brother cat, Reepicheep (AKA Editor Cheeps) help Amanda write all her books. You can follow their adventures on Instagram. Anything you can tell us about your upcoming adventures? Tortie Shorties Review: The cover of this amazing book perfectly illustrates the magic contained within it's pages. When our heroine Violet receives a phone call from her Grandma Daisy stating that she's dying, Violet rushes to Cascade Springs even though she hasn't stepped foot in town for 12 years following a devastating experience in high school. Grandma is actually healthy as a horse, but she needed to lure Violet home because the time has come for her to become "Caretaker" of her magical shop Charming Books. A birch tree grows inside the store and gets it's water from the town's magical springs, and the books inside have guided Violet's family for generations. Violet can't believe what she's hearing and is beyond perturbed by Grandma's deception. Then the next morning Daisy's beau Benedict is found dead in their driveway, strangled with her very own scarf, and Violet has no choice but to stay in town and clear her grandmother's name. Along the way Violet meets an enchanting cast of characters including two possible love interests, the police chief and mayor, Emerson the tuxedo cat and talking crow Faulkner, and those involved with Benedict's workplace at the livery (he was a carriage driver). I only wish Benedict hadn't been the murder victim so we could have gotten to know him better in life! This debut ended up being everything I was hoping for and so much more. The second book in this series will be on store shelves in December with a spotlight on Edgar Allan Poe...I'm practically counting the days!!! Another great interview and review! It would be great to win a copy!! That book looks like it's going to be a great read. Very nice interview, Mudpie. Emerson sounds like quite the character! :-) I will definitely be adding this to my to-read list, as I love books with cats in them. It sounds great! Loved the post and I'm so looking forward to reading Crime and Poetry. This sounds really good! Thank you for the giveaway! I love bookstores (especially upstate NY) and I love supernatural/paranormal so this book is perfect for me. I'm also a long time visitor to the Book Trail that runs thru upstate NY. What a lovely cover! The cats always draw me in! And what a great interview, Mudpie! And Emerson is so handsome! 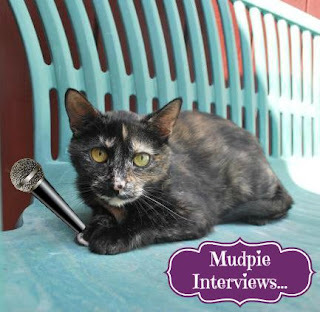 That was a really great interview Mudpie! I can see how you get these plum interviewing jobs and you picked a great subject and book to focus on! I think Emerson is a great name for a dapper tuxedo cat! Thanks for the info on the book and the chance to win! It looks great! 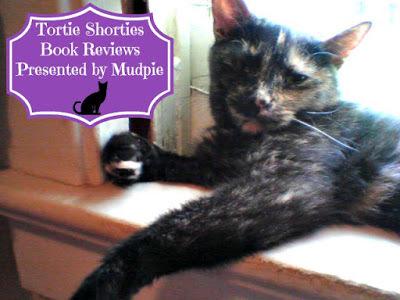 Y Dat was a pawsum review Mudpie. Yous just learned real good and doin' a great job. Mudpie you are great at reviews! A great interview Mudpie and Emerson! I enjoy cats and bookstores in a storyline. Can't wait to read "Crime and Poetry". congrats & continued success, Amanda!! Great interview and it looks like a nice book. Sounds like a lovely read! Thanks for the giveaway. Sounds like a great (and interesting) beginning to what I'm sure will be an awesome new series. Thanks for the chance to win. I am so intrigued by this book...Thanks for the opportunity to jump in. Great interview and the book looks interesting. I may have to add this series to my collection of cozy mysteries. I love cozy books, especially if they have cats in them! Could We Ask a Small Favor?